* These reviews may contain spoilers for the previous books in The Mortal Instruments series. To Sum It Up: Sebastian and his army of Endarkened, former Shadowhunters who have been forced to drink from the Infernal Cup, seem unstoppable. Their attacks on Institutes around the world have led to the evacuation of the remaining Shadowhunters to their homeland, Idris. Sebastian makes it very clear that there will be no end to his war until the Clave hands Jace and Clary over to him. Jace still has the heavenly fire burning inside of him, and as the Shadowhunters lose more and more of their own, he may be their only hope of winning against Sebastian. Ally's Review: The conclusion to The Mortal Instruments is as close to perfect as a book can be. The characters are on point and the storyline is entirely riveting. Cassandra Clare most definitely did not disappoint. City of Bones was the first Clare book I ever had the pleasure of reading. So obviously, TMI was my favorite series . . . until The Infernal Devices came out. After reading TID, there was no comparison. I was slightly concerned, going into City of Heavenly Fire, that I wasn't going to enjoy the book because of my preference for the other series. But I had no reason to worry because the book was all sorts of awesome. And the little TID insiders scattered throughout City of Heavenly Fire didn't hurt either, lol. The best part about any Clare book is the characters. In TMI, the family atmosphere among friends is always stressed, and that's because of the lack of blood relatives for a lot of the characters. In this specific book, I felt that vibe more than ever. When it came down to it, each and every one of them would have died to save each other. It is incredibly sweet and only makes me want to be a part of the Shadowhunter world even more. The relationship between Isabelle and Simon is given more spotlight, which I thought was awesome, but I think Alec and Jace's relationship got the most attention out of everyone's. I was thrilled about this because for the longest time I thought their parabatai bond was weak. It was only in this last book that I could actually see that bond between them. They have a lot of bro moments, which happened to be some of the best parts. For a while now, Jace hasn't been himself. In my opinion, he's been unnecessarily angsty and mopey, which made him plummet from the top to the bottom of my favorite character hierarchy. I was happy to see more of the original Jace that I had fallen in love with in this book. He gets a lot of his charm and confidence back, which makes him a lot more lovable. Clary always annoys me. I've never liked her as a character and that didn't change in this book. My annoyance with her was just more bearable with all of the other characters being a larger part of the book. Clare shamelessly plugs her next series, The Dark Artifices, all throughout City of Heavenly Fire. Typically, I would be really put off by that, but Clare made it work. She's a master weaver when it comes to connecting all her different story lines. It is a real pleasure reading about Emma Carstairs and the young Blackthorns. It made the book all the more intriguing and I am genuinely excited to read the next series. Although this book is huge, there is never a dull reading moment. The story is action packed and the characters are always up to something. Sebastian is the absolute perfect villain. I find it hard to truly hate him and I kind of consider him one of my favorite characters. He makes me laugh and often I feel bad for him. I feel that by the end of the book Sebastian's character is resolved. Lots of things are addressed, mainly his mommy issues, which is something I always wanted to happen. By the end of the book, almost all of my questions were answered. I had some sense of closure and I was happy with how all of the characters were left off. The ending is just beautiful. I'm a little sad that this era of Shadowhunters has finished but I'm looking forward to the next series. Something tells me that we haven't seen the last of Clary, Jace, and the gang. All in All: City of Heavenly Fire is a phenomenal ending to an amazing series. I'm happy with the way things ended and I couldn't have asked for a better book. I'm very excited to read The Dark Artifices. Lee's Review: So here we are: the conclusion of The Mortal Instruments. This is one of the longer series I’ve stuck with, and although it hasn’t been a five star read across the board, overall I’ve still enjoyed it very, very much. TMI introduced me to Shadowhunters, Downworlders, and mundanes alike, and for that alone, I’ll always have a tender spot in my heart for the series. While I expected to feel a little nostalgic and wistful about saying goodbye to TMI, I didn’t really foresee the book hangover that ensued. Going into City of Heavenly Fire with the knowledge that 1) it’s over 700 pages and 2) there are two more Shadowhunter series on the horizon made me a little wary of how many of those pages were going toward setting up those series. Yes, you’re introduced to the next generation of Shadowhunters, BUT. This book is as much about the past as it is about the future, and because of that, because of the pages that reference the past, I cannot knock the pages that are devoted to glimpses of the future. And I cannot get any more specific than that without getting super spoiler-y. Believe me, it is killing me not to gush over some of my favorite scenes and quotes because they would totally ruin the surprise of more than this book. Now, please don’t panic and think that the TMI characters you’ve known since City of Bones have been pushed to the backburner. They most certainly have NOT. I loved that the core group of Jace, Clary, Isabelle, Alec, and Simon spent plenty of time in the spotlight—together. Their stand against Sebastian takes them on a journey that is absolutely hellish. Their dedication to their mission, which they are fully aware may not succeed and may very well kill them, is unwavering and awe-inspiring. For all of the squabbles that these characters have had at various times with one another, nothing matters more in this book than stopping Sebastian from destroying the world. Even Jace and Clary leave their personal melodrama behind them and focus on what needs to be done. There’s a maturity to everyone in this quintet that really made me realize just how much they’ve grown as characters. Sebastian obviously looms large throughout CoHF, and, being Sebastian, he’s more than happy to engage the Shadowhunters in a few deadly rounds of cat and mouse before launching his all-out assault against them. The fighting scenes between the Endarkened and some other allies Sebastian has managed to gather and the Shadowhunters are some of the series’ fiercest. No TMI book would be such without demons, and CoHF features plenty of those nasties, too. He may be dead, but Valentine Morgenstern continues to cast a shadow over the characters. If he hadn’t gone all Dr. Frankenstein and experimented on his own children, particularly Sebastian, so many lives would have been different. Valentine essentially robbed Jace of his identity, and I was especially drawn to Jace’s careful consideration of claiming his true heritage. In fact, I was extremely happy to see this addressed and not forgotten amid the book’s much larger plotlines. City of Heavenly Fire gave all that I could have asked from it, plus a little extra. Whatever doubts I had about the Shadowhunters’ chronicles continuing for another two series were erased thanks to this book. The breadth of their history and the way that their stories intertwine across time just amaze me. I am nowhere near ready to say goodbye to the Nephilim and eagerly await the release of Lady Midnight next year. For those of you who still haven’t checked out The Infernal Devices, now has never been a better time to do so! 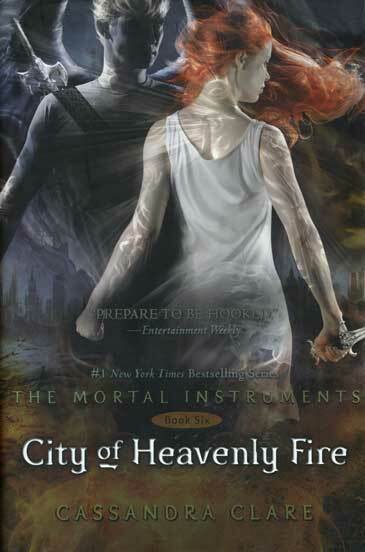 All in All: City of Heavenly Fire is a spectacular finale to The Mortal Instruments, complete with action, suspense, romance, humor, and . . . fire. Lots of fire. Great reviews!! I have to say that while I was reading this one, I thought of you. I haven't read TID yet, but I was giggling over what was there for us in this one and knew you guys should be enjoying it. I personally didn't like the look ahead to the new series because I felt it was a little overwhelming with how often those characters were mentioned for no real reason. I do intend to read it eventually, but I have to read TID first. I too enjoyed seeing more of the other relationships spotlighted. I think Sebastian is an amazing villain and did this crowd justice with what they were up against. Loved the reviews! Jaclyn @ JC's Book Haven. As much as I try to break out of it, I'm still suffering from TID withdrawal, and the series ended LAST YEAR. It's gotten a little challenging for me to rate TMI on its own merits since it's become quite entwined with TID, especially over the last 2 TMI books. I'm very curious to see how the upcoming new series pulls all of 3 of the current Shadowhunter series together, which I have no doubt it will. I can't wait for you to read TID; I never get tired of gushing over it, lol. It's OK- I know you'll get to TID eventually! :D I know I never shut up about that series, but that's because it's really, really, really, really good, lol. Clare truly pulled out all the stops for CoHF. It was the type of read that I didn't want to end and left me extremely eager to get my hands on the next Shadowhunter book. I was iffy about checking out the Bane Chronicles, which are being published together in a printed book in November, but yep, I've pre-ordered it because I NEED more Shadowhunter stories to tide me over!